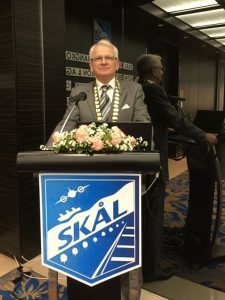 Bangkok (Thailand) – March 28, 2018 (travelindex.com) – At the AGM meeting of Skal International Bangkok held on the 28th March 2018 at the Lancaster Hotel Bangkok, Andrew J Wood was elected President. Andrew has been a Skal member for 26 years and is not new to the position having held the post of Club President in 2008-10. Andrew is a long serving member of Skal and is a past National President of Skal Intl Thailand and International Councillor 2006-2010. In 2010 Andrew was elected to Skal International’s Executive Committee and accordingly relinquished all his club and national positions. Andrew is also active at regional level and is Acting Vice President Southeast Asia for the Skal Asian Area. Commenting on the election Mr Wood said, “The Bangkok Club has had a long and illustrious history in the travel and tourism industry in Bangkok since 1956. My thanks go to my predecessor President Eric Hallin and the board of officers of the Bangkok club. I am delighted that Eric has also been elected VP to provide the continuity that the club needs to move forward. “Bangkok is the most visited city in the world,” he said, “with over 21 million visitors annually. Beating London, Paris and New York. Tourism is booming in Thailand and is set to once again reach record heights. I am absolutely convinced that the Skal Club of Bangkok can also grow and blossom, to be one of the world’s largest Skal clubs. “Skal International has over 14,000 members worldwide, in 354 clubs in 83 countries. I see no reason why the Bangkok Club cannot grow to be one of the biggest too. My goal in the next two years is to be one of the top 5 largest Skal clubs in the world,” he added. Skål is a professional organisation of tourism leaders around the world, promoting global tourism and friendship. It is the only international group uniting all branches of the travel and tourism industry. Its members, the industry’s managers and executives, meet at local, national, regional and international levels to Do Business Among Friends. Skål International today has approximately 14,000 members in 354 Clubs throughout 83 countries. Most activities occur at local level, moving up through National Committees, under the umbrella of Skål International, headquartered at the General Secretariat in Torremolinos, Spain. Be a trusted voice in travel and tourism since 1934.